Chocolate notwithstanding, the Swiss are more famous for precision and neatness than they are for play. Yet all over the Alps, from Zermatt to Grindelwald, and Fiesch to any of a hundred other towns and villages, the Swiss work hard at play. Summer or winter, or any season in between, their chief game seems to be defying gravity. In winter, of course, it's about skiing. And knowing that what skis down will want to come up again, they have worked hard at a range of anti-gravity devices. 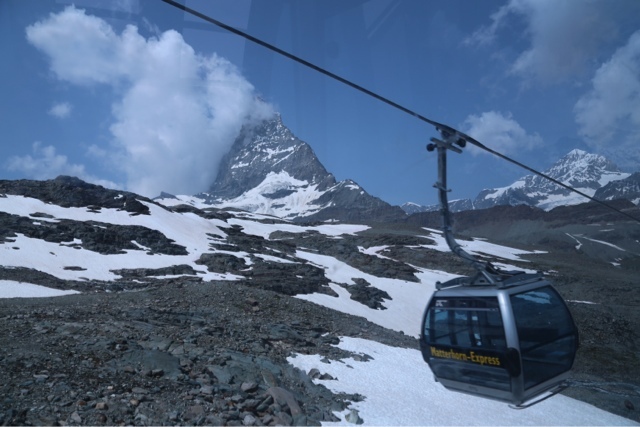 Any skiable mountain usually has a complex of gondolas, chairlifts or cable cars criss-crossing its slopes. 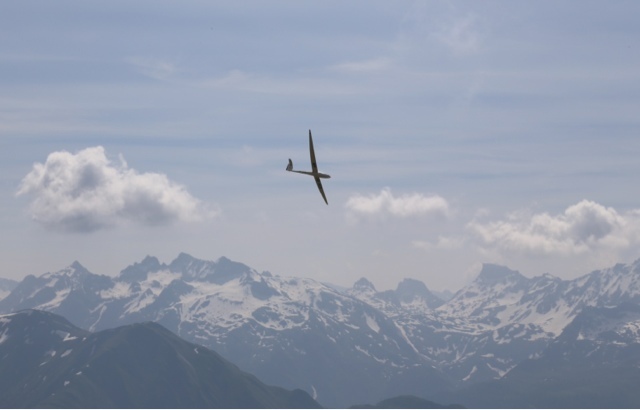 In summer, even though the upper slopes have enough snow to make a Tasmanian skier salivate, the Swiss prefer taking to the air. 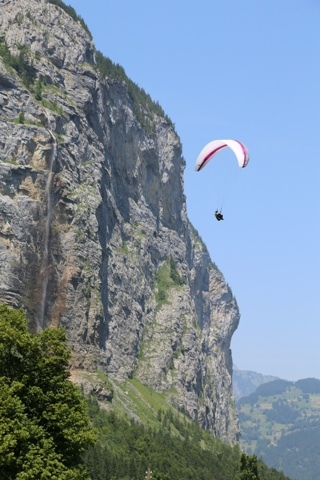 On a good day, a day when the sun soaks the slopes and thermals spiral heavenward, the skies fill with gliders, predominantly paragliders, but also hang-gliders and just plain gliders. We go exploring the Fiescheralp on such a day. From early morning onwards there are hundreds of coloured, curved sails propping up the sky. Some swirl and swing with a slow haste, as if their operators crave the solidity of earth once more. But others are more at peace with the air. They hold back time with nylon wings; ease skyward on invisible plumes, descend languidly. There is something feminine in the recurve of their sails. It is the hover of a mother hen gathering her chicks, of God brooding above the waters of creation. 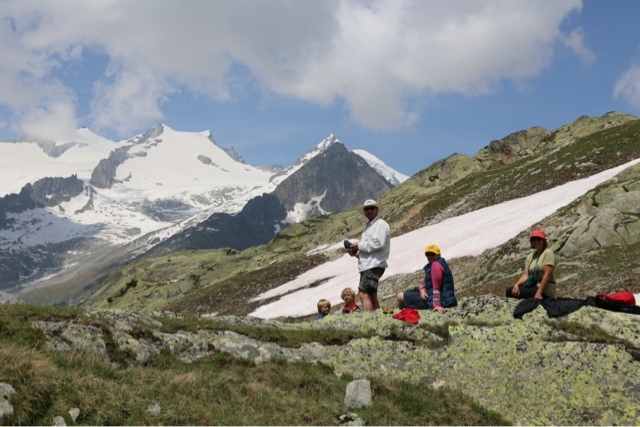 It has been a late spring in the Alps, and snow drifts have lingered longer than normal at lower altitudes. 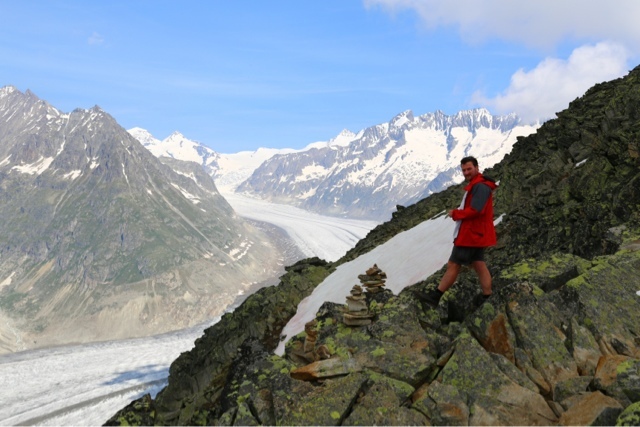 We had planned a traverse of the slopes above mainland Europe's longest glacier, the Aletsch, but snow has kept the track closed. We look longingly across the wide, sinuous glacier; consider stepping over the barrier and walking anyway. But this is Switzerland: civil disobedience isn't part of their graffiti-free, litter-free ethos. Besides there is always another path. Chris and I take out our frustration by pounding up the nearest peak, the relatively easy Bettmerhorn. But towards the top that track too is closed by snow, so we settle for a lower summit, perched above the Aletsch. Once it would have bothered me not to have "topped out" on the actual peak. But the others are waiting below, and right now it feels wonderful just to be high in the Alps with an old friend. While we ponder this, the sky grows busy with paragliders. Occasionally something larger and noisier swishes over: a full sized glider. I had always thought gliders were noiseless, but these make a whirring, mechanical buzz, neither loud nor noiseless. Unlike the paragliders, there is no chance of eye contact with these "drones". We return to the others, choose our alternative path, and wander downwards. The alpine meadows are full of wildflowers: purple gentians, deep pink alpenrose, bright gold buttercups. Birds and marmots chip and chatter. 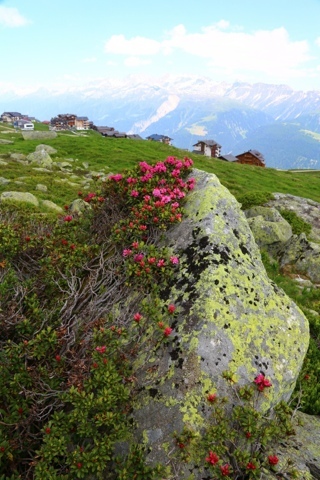 Granite outcrops are splodged with almost luminous lime-coloured lichen, set against a blue sky and snowy peaks. The colours and sounds seem all the sharper for this being a short, late summer. Our now-shorter walk gives us the luxury of a long picnic lunch. We spread out on the grass, relaxing under the occasional envious gaze of a paraglider. I suppose you can work up quite an appetite defying gravity.